When I was about 14 years old, my mother took me to my first meditation class with the intention of helping me with the physiological part of being a high performance swimmer. I remember the words of my meditation teacher when she said “ If you ever have a dream is because the universe gave you the power to achieve it “ I started paying attention to the series of events that kept happening in my life, these events were a consistent prove that the power of the mind is limitless. I went to university for 8 years, studying civil engineering in Panama and an environmental masters degree in Spain. I felt that something was missing and I wasn’t enjoying being an engineer as much as I thought. I had a clear intention of traveling the world and interacting with as many different cultures as I could, that’s when I had the golden opportunity of working for various American reality tv shows. The jobs with the tv shows took me around the world, working with amazing talented people in many different cultures for the following 13 years. I realized that the person that I am today is combination of the experiences and conversations that I had with the many inspirational humans that I met along my journey. I started practicing yoga 10 years ago in Queensland, Australia. I was hooked right away, while training for a long distance swimming competition. The benefits of the asanas in my body and mind were directly reflected in my performance. Since then I kept practicing on and off wherever I could. In 2014, I met my wonderful wife Maya in a little surfing town in Nicaragua, a couple of years after that we decided to open Casco Yoga. During a surfing holiday in Indonesia in October 2017, I ended up in hospital with a stroke that paralyzed the left side of my body, that’s when I discover the tangible benefits of meditation. During this time my approach to meditation was crucial and luckily my wife Maya made me a recording with a guided meditation called yoga Nidra. The combination of Maya’s gentle voice with the meditation settled my mind in a way that was finally able to fall asleep, consequently I started to get better. After almost a month in hospitals, I went to a few physiotherapists for rehab and what I noticed in every single session, is that the exercises that they gave me were yoga poses that I have been doing for years. My New Years resolution for 2018 was to do at least 5 yoga classes a week and after 8 months this year, I have done more than 5 classes a week feeling better than ever. I realized that I have a brand new life and there are many reasons to make the best of it. 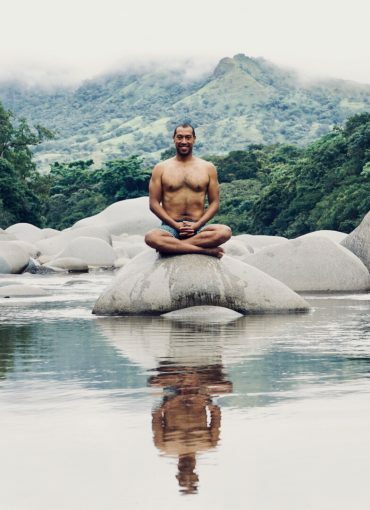 After seen all the miracles that my regular yoga practice did during my recovery, I decided to become a certified yoga teacher to be able to share the magic of the asanas and ultimately becoming a meditation teacher to spread the meditation practice to more people. I believe that meditation is going to be the new health revolution. Having the access to teach classes at Casco Yoga is another sign of the universe telling me what’s my purpose in life.